Poly Carts Include polyethylene shelves and chrome plated posts. Shelf holds 150 lbs. Cart capacity is 400 lbs. Moves easily on four 4" dia. resilient rubber swivel stem casters. Easy "no tools" assembly. Shelf color is Charcoal Gray. Available in 2?shelf and 3?shelf models. 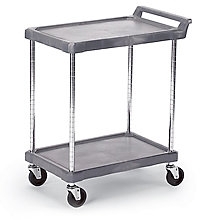 Carts are 33?1/4" H.
Metro® MQUC2436G-35 - MetroMax Q® 2436 Utility Cart 3-shelf grid, 304 Stainless handle and 5MPX polyurethane casters.